Refrigeration issues are a frequent source for instruction – usually through faulty manufacture or set-up. Examples include the failure of refrigeration machinery at fish processing plant, a fridge-freezer design problem that we investigated for BBC Watchdog, and several container loads of used refrigerators that failed electrical tests. Our most unusual boiler investigation concerned a pair of steam ploughing engines, while in quite different instances, we investigated the cause of fires in Chinese-built mash boilers, failure of an aquaculture heating system, and a community outbreak of Legionnaires’ Disease. A third of the 6000 tubes in a large thermal recuperator (erected in Kentucky) failed within 24 hours of start-up. During warm-through, only a very light, temperate flow of combustion products had passed over the matrix. We were commissioned to undertake a design fault investigation, which showed that the Strouhal Number for the tubular array indicated these conditions to correspond with those necessary for vortex-shedding. It was further demonstrated that the frequency at which this occurred coincided with the tubes' natural resonant frequency at the prevailing temperature, causing failure under high cycle fatigue. We presented our failure mode & effects analysis (FMEA) to the State Court of Ohio in Cleveland over the course of a five-day hearing and received commendations from attorneys on both sides. As remarked elsewhere, the Environment Agency had been called in response to complaints of excessive vapour plume emission from the exhaust stack of a biomass-fired shell & tube boiler. While the Design FMEA indicated that the system was losing water, visual inspections had showed no defect. 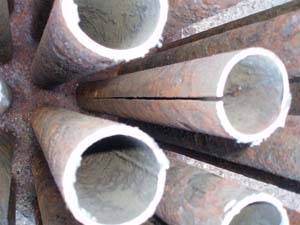 While closer investigation showed it to be losing water through faulty tubes, this could not explain why the seam welder had "missed" a significant length of run as the formed section passed through the mill, nor how inspections at tubemill, stockholder, converter and the boiler manufacturer had all passed unnoticed. We were appointed for the defence in a criminal prosecution. Its operatives had admitted to sabotaging a high pressure plant for essential oils extraction. Although they had claimed it to be dangerous, each one of them faced a long prison term - given that the owners had said it was worth a seven-figure sum. However, its price was not its value. Preliminary FMEA prompted undertaking of a design fault investigation, from which it emerged that the equipment had never worked in commercial production, and could not be made to work save at disproportionate expense; also, that its design and construction presented clear operational risk. The men were fined and released. 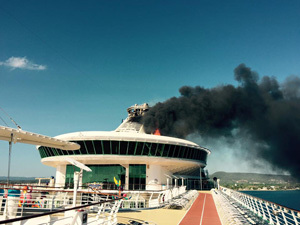 A leading manufacturer of waste heat boilers and economisers engaged us as forensic engineer to investigate the increasing incidences of ship's funnel fires. Searches at Lloyds of London revealed little of direct interest, while inquiry into the clients' design procedures showed them to be entirely conventional. Our analysis of reporting dates reflected a history co-incident with changing practices in ship operation - particularly the burning of increasingly heavy cuts of fuel oil and much-reduced times alongside. The thermal failure mode analysis of current operating profiles showed uncombusted heavy oil fractions to layer a tacky film onto tubes and flue walls at the end of one operating cycle, attracting solid smuts from incomplete combustion upon the next cool start. We demonstrated that temperatures would then rise during warm-through until the Lower Explosive Limit (LEL) was exceeded within the economiser tubestack, with ignition caused by sparks entrained in the exhaust gas stream. Other examples include resolving the failure of a large perforated calender during commissioning of a new lofted tissue production line, thermal behaviour of rotor blades in military helicopters, and the design fault investigation of a new low pressure hot water boiler plant installed on the campus of a British university.